I’m writing this while sitting in my mother’s house, wearing almost the only pair of socks to my name. The reason for this begins on Friday night, and almost unbelievably, is still continuing now, as I write this, on Tuesday evening. Since I travel a lot for martial arts trips, and I’m always aware of the dangers of lost or delayed luggage (and broken bones! ), I have multi-trip travel insurance with Multitrip.com (in fact, I opted for a premium level of cover to allow for a larger amount of luggage compensation in the case of loss). Once my bag didn’t arrive on Saturday, I knew I’d need some help or provision for some emergency supplies, so I searched around the Multitrip website and eventually found a number to call. I was redirected to a call centre and told that this line was for medical emergencies, and that I’d have to call the claims team on Monday since they’re only open Mon-Fri, 9-5. I was advised that I should buy whatever I need, and then I could send the receipts in for consideration of refund, but they couldn’t confirm I’d be covered for these expenses. Anyone who follows me on twitter, is friends with me on facebook, or knows me in general will understand why I had to explain to Multitrip why simply “buying whatever I need” wasn’t an option – shortly before my trip to Germany, I had a house fire. Most of my clothes are not currently wearable, and have been deemed impossible to salvage also, so I had recently had to buy lots of replacement emergency clothes, for which I am, of course, still waiting for a refund from my home insurance. Most of these replacement clothes were in the case that had been lost, leaving me in a very difficult position. Multitrip said there was nothing they could do, I would simply have to wait until Monday. By Sunday, I was feeling pretty worried that my case still hadn’t been located, so I researched my rights regarding delayed luggage, and came across the Montreal Convention. This is a convention which says that airlines must pay compensation for many of the common problems with air travel, such as delayed flights, denied boarding, and delayed luggage. There are lots of resources which explain the convention, so I was reasonably confident of my understanding of it when I called Lufthansa. Lufthansa told me that, of course, they would pay for my emergency expenses, but only 50% of them. When I asked for clarification, I was told that this was part of the Montreal Convention. Huh? I checked and double-checked the convention, and all of the sites I had found, and none of them had any statement which implied that airline liability was somehow capped at 50%, so I asked Lufthansa on Twitter to clarify. They told me that any refund is in accordance with their liability policy (PDF), which they linked me to. By Monday, my bag still hadn’t arrived, so I called Multitrip to speak to someone about a claim. This is when I found out that my bags are magic. You see, Multitrip defines a “trip” for me as starting when I leave my “home” (place of residence, not country of residence), and finishing only when I return to my “home”. You would imagine, then, if bags didn’t arrive in Dublin Airport, a place which I am not currently resident, that they would be part of my trip – no, my bags are special. Multitrip only care about your bags on the way out to your destination – in other words, there is only cover for a delayed bag on one leg of your trip. If your bag is delayed on the way home, you’re just plain out of luck. So while I must complete trips by returning to my home, my bags need only fly to my destination, and apparently magic themselves home. I informed Multitrip that I would be cancelling my policy and looking elsewhere, and I can only encourage you to check your own travel insurance policy to see if your insurer also doesn’t care what you lose on the way home. Shortly after calling Multitrip, I received my first call from Lufthansa – they thought they had found my bag. They were going to try to get it on the 5pm flight, and would call me back to let me know if they had managed it. They didn’t call me back. Monday evening came and went, and with absolutely no clothes available to me, I had to go and buy some supplies. On Tuesday, when my bag still hadn’t arrived, I called Lufthansa. They told me that there was something wrong with my phone, that the number I gave them must have been incorrect, that no one could get through to me. I found this hard to believe, since my phone is almost never switched off, has a voice-mail facility, and had received multiple calls on both Monday and Tuesday without issue. I confirmed my number (it was correct), and gave them an additional number to try (my mum’s phone). When I arrived home from work that afternoon, they hadn’t called my mobile, nor the alternative number I provided them with. I called Lufthansa again, asking why I hadn’t been called, confirming my details again, and was told that someone would call me back soon to arrange delivery. When I asked why I couldn’t just arrange delivery now, Lufthansa said that the delivery company had to speak directly to me before arranging delivery; so the company that apparently couldn’t call me or leave a message needed to call me or leave a message before delivering my luggage. Great. I waited another hour or two, and then called again to ask why no effort had been made to call me. I was told that it must have been an issue with my phone (again), that my number was wrong (again), and that it was now too late for any deliveries so there was nothing they could do. My luggage was going to spend another night tantalisingly close, but not with me, because apparently I’m harder to get a hold of than the Doctor. At about 7.30pm that evening, I received a very interesting call from the delightful Sky Handling Partners (seriously, check out that professional looking site – doesn’t it fill you with confidence?) who wanted to arrange for the delivery of my luggage the next day. After a brief conversation about what time the luggage would come at, I asked how they were able to call me this evening, when they had been completely unable to for the past two days. The answer I got was brusque to say the least. I was told once again that my number was wrong (it still wasn’t), and that there was a problem with my phone (there wasn’t, and still isn’t). When I said that my number wasn’t incorrect, and that I had even provided another number as an alternate contact, I was told that they had tried twice on Monday, that they didn’t have the time or resources to keep calling just one passenger over and over, and that they have other airlines to manage, you know! I tried to ask why they didn’t leave a voicemail if they were unable to get through, but I was cut off, and told that there was no point in going through it all again. I was genuinely appalled at the way I was spoken to, so after terminating the call, I called back to ask to speak to Customer Service so that I could register a complaint. I’m reasonably certain that it was the same, extremely rude woman who answered the phone and told me that they don’t have a customer service department, and if I wanted to register a complaint, I’d have to write, so I asked for the email address in order to do so. This brings us to today – I’m still without my luggage, though hoping that it will arrive today. The way Sky Handling Partner spoke to me, however, gives me no confidence in the planned arrival of my luggage, and makes me worried about what condition my luggage might be in if it ever does arrive. I have submitted a complaint to Lufthansa about the way this has all been handled (Feedback ID FB-ID 21983388 if you’re reading, Lufthansa! ), though I’m not confident about the speed of their reply, and I simply won’t accept this 50% provision unless they can show me where it’s mentioned in that linked liability policy they gave me – how can a company insist on being 50% liable for something that’s 100% their mistake? I’m out-of-pocket for more replacement clothes I’ve had to buy to replace the replacement clothes that Lufthansa lost, and with Lufthansa seemingly only willing to pay 50%, I’m likely to be left out-of-pocket in the long-term. I fly often with Lufthansa, and have always thought of them as a very reliable airline, but these current difficulties have made me rethink that position. So, Lufthansa, Multitrip.com, and Sky Handling Partner – please, I’m not asking for much. I don’t want world peace, or the Hope Diamond, I just want my dirty socks. We regret that your checked baggage did not arrive following your flight LH982 from Frankfurt to Dublin on 14 June 2013. Please accept our sincerest apologies for this unfortunate occurrence and for any inconvenience caused. In addition, we are sorry to learn about the unfortunate event that happened to your home prior to your trip. Luggage is normally handled with accuracy and care and the vast majority is processed without incident. Of course, we realise that statistics are of little meaning to a passenger whose luggage has been delayed and regret the less than positive impression gained. According to our records we are glad that your baggage was delivered on 18 June 2013. In cases of delayed baggage delivery the customer is entitled, to a reasonable extent and taking his/her standard of living in consideration, to buy consumer items and toiletries which correspond to the content of the baggage which is temporarily delayed. Furthermore, in order for us to process your claim, kindly ask you to provide us with your receipt of interim purchase in PDF or JPEG format along with your complete bank details, including IBAN (International Bank Account Number). Thank you for your assistance in this matter. Emphasis my own there, highlighting the paragraph where they discuss their policy, but still fail to tell me where exactly this policy is specified. I have responded to clarify that, due to issues in Dublin, my bag was not returned to me on the 18th, but is still in Dublin Airport. I have also told them that their policy explanation is not accepted, because that is not the policy which is stated on their site. Thank you for your reply, but I’m afraid that while I’m aware of your 50% policy, it doesn’t seem to be stated anywhere in the policy documents which you linked to me, and as such, I don’t see how you could possibly apply it. There is no mention of 50% or sending clothes back in the liability document which you linked me, so I do not accept this option as viable or correct. Additionally, further issues with unreturned phone calls mean that your records are incorrect – my baggage was not returned to me on 18th of June, and instead is still in Dublin Airport today. I am not asking you to cover exorbitant expenses and I haven’t purchased expensive specialist replacement clothes – I purchased desperately needed socks, underwear, and the cheapest and plainest t-shirt that I could find while I waited for a mistake that I didn’t make to be resolved, and it is simply unacceptable to state that your policy is to only refund 50% when a) the error was not mine, and therefore I am not 50% (nor any percent) responsible for it, and b) it’s not actually stated in your policy. The policy document sent to me is here – If you could be so kind as to highlight for me where on this page the 50% margin is made clear, I’d be delighted to review it. At the moment, I am not satisfied to close this complaint. I’ll keep you posted with further updates if and when they come. But.. hang on… I… that doesn’t make sense… If your phone number was wrong, how come they were able to get through to you at 7:30? Been following this and your other saga on Twitter, and really feel for you. FWIW, your experience is enough to put me off ever flying with Lufthansa, but sadly, we mere mortals have no say over who any airline use as handling agents. It may be that the airline are being held over a barrel by poor customer service by Sky too, of course, though it appears they’ve hardly made an already bad situation any better, if that is so. On insurance, do keep pressing. There are simply too many examples around of companies getting away with making up the rules as they go along. I do think you’ll find that many companies play the trick about luggage on the outgoing journey only. However, you explained to them your difficult circumstances, and one would believe they could, and should, exercise some discretion. I actually explained the house fire situation to almost everyone I spoke to in Lufthansa, Multitrip, and even Sky Handling Partners. They all do know exactly how stuck I am, and that I can’t simply just make do with other clothes until my case appears. In response to this knowledge, though, Lufthansa have stuck firm on their 50% thing (though they’re sorry about my fire), Multitrip said that if my luggage was totally lost they might be able to do something, but there’s nothing they can do to help re: my delayed bag, and Sky Handling Partner barely let me get the words out of my mouth before telling me there was no point in going through everything again and giving out to me about my wrong (not-wrong) broken (not-broken) phone again. I realize you can’t comment (to me) on this case, but this case raises an important GENERAL question which I should like you to answer. If you don’t publish all your terms and conditions on your website (such as the 50% “rule”), please could you tell me where you do publish your additional terms and conditions. I am travelling with Lufthansa in a week or so and I should like to check on your terms and conditions with respect to lost, delayed and damaged baggage (and indeed any other areas where you apply rules you don’t publish) before I fly with you. For shits and giggles, let’s assume you DID buy something, and return it to them for a full refund. What the heck are they going to do with it? Throw it away out of spite? This is ridiculous! I have been wondering myself what they do with the clothes. They couldn’t be returned, since they’d be worn. It would be such a waste to throw them out, but after my dealings with them, I’m not sure their magnanimous enough to donate them all either. Maybe I’ll ask them, if they ever reply to me again! Well that is very interesting, thanks for that! 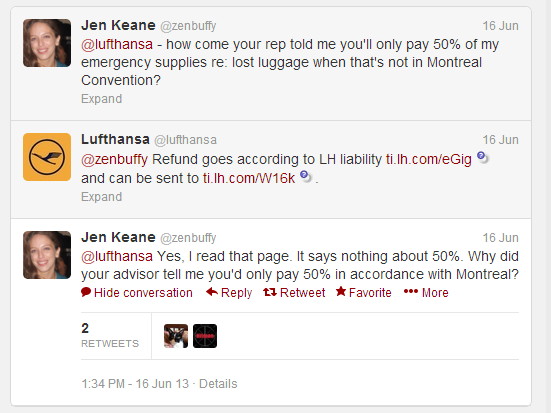 That kills Lufthansa’s claim that the Montreal Convention limits their liability to 50% absolutely stone cold dead. Appalling conduct from all companies involved. They should be ashamed. I hope you get satisfaction. What a bunch of bastards. They know they should not cap compensation, but everyone there puts out that it is set at 50%. This must be an organizational directive drummed into every operative at their induction: “Lie through your teeth, and we’ll probably get away with it”. Thank you very much for your online comment dated 28 June 2013. We appreciate the opportunity to address your concerns. We have checked our system carefully but could not find a previous correspondence from you regarding the same enquiry. We are sorry that our regulation policies for baggage irregularities are unclear and difficult to find on our website. Please accept our apologies for any inconveniences caused. Therefore, we would like to take this opportunity to give you some background information. Our regulation for replacement purchases in cases of bag delays is an internal policy and may vary from the policies of other airlines. Kindly allow us to explain our standard reimbursement procedure in such a case. We reimburse half the costs for shoes and outer clothing, because these items will remain in your possession and the full cost of toiletries and underwear. If you would like to receive reimbursement for 100% of your purchases, it is Lufthansa’s policy to reimburse reasonable interim purchases up to the maximum liability limitations stipulated in the Montreal Convention. In this case we would ask you to forward the purchased items (excluding toiletries and undergarments) along with the original receipts to us. However, if you would like to keep the purchased items, as they are considered to be of long-term use to you, we will reimburse half the costs for shoes and outer clothing and the full cost of toiletries and underwear. We are always grateful when our guests take the time to tell us of their impressions and give us specific indications about where they feel change is required. Suggestions such as yours, together with the results from regular passenger surveys, allow us to consider our guests’ current opinions and evaluate our offers and services on the basis of specific examples. Apart from quantitative analyses, we use our guests’ detailed feedbacks in order to review these topics with our departments. Your feedback is also being used as an example to highlight our guests’ current perspective of information given on our website. With this in mind we would like to thank you for taking the time to describe your experiences. We hope that this information is sufficient for your purposes and we look forward on welcoming you on board a Lufthansa flight soon. Unfortunately, the information you have provided is not sufficient for my purpose. You link to http://www.lufthansa.com/nl/en/Liability-and-insurance where no such policy is stated. Moreover, your “policy” is not stated ANYWHERE on you website. You also cite the Montreal Convention which contains no such provisions. This leaves me concerned that you have other terms and conditions / policies which you don’t publish on your website which you would try to apply if I ever had a problem with your airline. Please could you inform me where I can read ALL your terms and conditions and policies prior to travelling with your company. Lufthansa is applying unpublished terms and conditions retrospectively to its contracts with its customers. This is the kind of behaviour we’ve come to expect from firms like RyanAir, but I am frankly astonished to encounter this from an Airline like Lufthansa which has (or had) a good reputation to defend. This has certainly tarnished Lufthansa’s reputation in my eyes – an if you ever try such a thing on me (and you are reading this) I’ll see you in court! Thank you for your email dated 4 July 2013. We regret to learn of your disappointment with our response; however we appreciate this opportunity to further address your concerns. We assure you that Lufthansa strictly applies the Montreal Convention which determines the airline’s responsibility for baggage irregularities. It does not, however, specify terms and conditions for reimbursements of interim expenses in cases of bag delays. We therefore kindly remind you that Lufthansa’s policy, as outlined in our previous correspondence, may vary from the policies of other airlines. Please allow us to also draw your attention to what is known as the obligation to minimise damage that applies to all passengers in similar situations. With this in mind, each claim will be assessed individually by us. Unfortunately our internal reimbursement policy for interim expenses in cases of bag delays cannot be found on our website nor can we provide you with internal documents. As already outlined in our previous correspondence we have nevertheless forwarded your comments to the relevant department for their consideration. Rest assured that we make every effort to optimise our baggage processes so that irregularities do not occur. In order to accomplish this we regularly conduct analyses and projects which are dedicated to maintaining and improving the quality of our baggage reclaim procedures. We do hope that this further information is helpful for you and that you will give us the opportunity to convince you of our efficiency in the future. Thank you for your email of 2013 July 10. You have not addressed my concerns at all. As I have already pointed out, the Montreal Convention does cover bag delays and does not contain the provisions you apply – as the U.S. Department of Transportation noted when it fined you $50,000 for falling to honour this treaty and unfairly limiting reimbursements to 50% (http://www.dot.gov/briefing-room/lufthansa-fined-improperly-limiting-reimbursements-delayed-baggage). You can’t make contracts with your customers that are based on “internal policies” which you don’t publish to your customers at the time they make a contract with you. This would be a legal nonsense. These policies are not “unclear and difficult to find on [your] website” as you put it in your earlier message; these policies are not on your website. I have not questioned your “efficiency”. I do question your honesty and sincerity. In the past I always had a high opinion of Lufthansa – based your reputation and my own experiences. Your replies to me in this matter have seriously dented that opinion. If I ever travel with you again and you lose my bags, rest assured that I shall insist on my full rights under the Montreal Convention and will take the matter as far as necessary in order to obtain those rights. Thank you for your e-mail of 21 July 2013. May we assure you again that Lufthansa strictly applies the Montreal Convention which determines the airline’s responsibility for baggage irregularities but which does not specify terms and conditions for reimbursements of interim expenses in cases of bag delays. Once again we would like to highlight that we reimburse reasonable interim purchases up to the maximum liability limitations and of course give our passengers the opportunity to receive reimbursement for 100% of the purchases as stated in our first correspondence. We are sorry that our policy is not published on our website but rest assured that it is not a secret policy. As already outlined, we have informed the relevant department of your comments for their consideration and thank you very much for taking the time to describe your experiences. Unfortunately, at this point there is nothing more we can do for you. We are therefore sorry to inform you that this is our final reply. Our decision remains unchanged and without presentation of new elements to your claim, we consider this to be our final response and your file to be closed. Although we are unable to give you the answer you were anticipating, we would be pleased if you continued to include Lufthansa in your travel plans in the future. Same thing happened to us. NO ONE is helping us. We are in Italy and our baggage has been lost in Frankfurt. Days without anything! Lufthansa is ruining our whole trip!